Kohl's Corporation (NYSE: KSS) shares climbed 7.41 percent to $46.36. The volume of Kohl's shares traded was 580 percent higher than normal. Kohl's reported stronger-than-expected earnings for the third quarter. NetEase Inc (ADR) (NASDAQ: NTES) shares rose 5.27 percent to $157.99. The volume of NetEase shares traded was 389 percent higher than normal. NetEase reported Q3 earnings of $2.24 per ADS on revenue of $1.05 million. Popeyes Louisiana Kitchen Inc (NASDAQ: PLKI) surged 6.89 percent to $54.68. The volume of Popeyes Louisiana Kitchen shares traded was 323 percent higher than normal. Popeyes Louisiana Kitchen reported better-than-expected earnings for the third quarter and raised its full-year earnings guidance. Gildan Activewear Inc (USA) (NYSE: GIL) shares moved up 3.27 percent to $28.45. The volume of Gildan Activewear traded was 187 percent higher than normal. Gildan Activewear reported upbeat Q3 earnings. 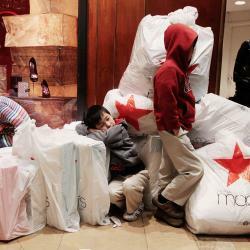 Macy's Crashed Following Its Troubled Outlook: Are Analysts Bullish?